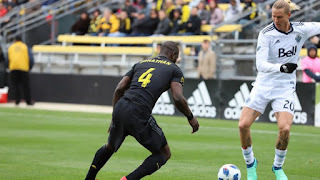 Booed on every touch by Columbus Crew SC fans, Kei Kamara scored the winner on a triumphant return to Columbus to lift the Vancouver Whitecaps FC to a 2-1 win over his former club at MAPFRE Stadium Saturday afternoon. Kamara beat Wil Trapp to a well-weighted Felipe cross and headed past Zack Steffen in the 78th minute to cap the Whitecaps comeback. It was his third goal of the season, 101st in his career and sixth in 15 all-time matches against Crew SC (3-1-1), who suffered their first loss of the season. The goal came just after Alphonso Davies had a goal called back following Video Review after it was determined he handled a Kamara pass before a rampaging run at goal. Gyasi Zardes scored his fourth goal of the season just before the half-hour mark to put Crew SC in front, 1-0. Vancouver goalkeeper Stefan Marinovic dove to push aside a long-distance Pedro Santos attempt. But he spilled it directly to Zardes, who easily tapped in the game’s first goal. The road warrior Brek Shea leveled for Vancouver (3-1-1) in the 51st minute, smashing a ball that came off the hands of Steffen, who challenged a Bernie Ibini-Isel cross. It was Shea’s second goal of the season — both coming away from BC Place. Artur had a golden chance to equalize when he latched onto a Federico Higuain corner, but he put his glancing header off the crossbar.